A wonderful opportunity to experience the sunset over Positano followed by dinner with the town’s twinkling lights as a backcloth. 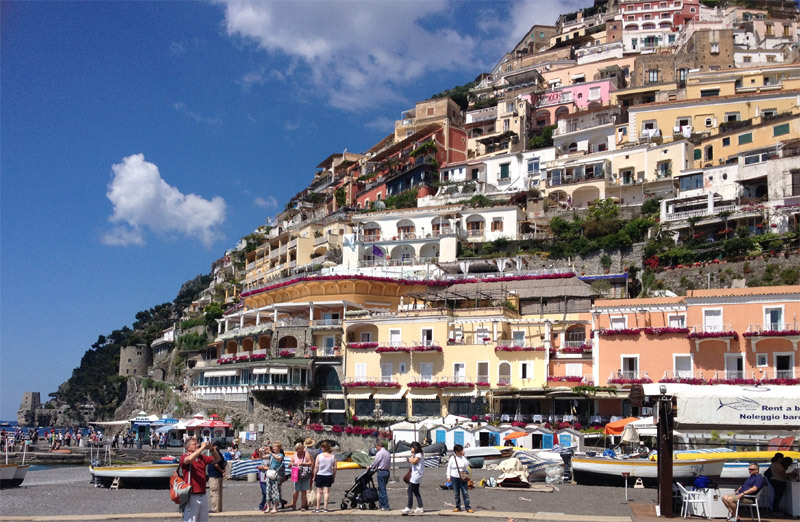 Pickups from hotels in Sorrento start at 5 pm and you will enjoy a drive along the breathtaking Amalfi coast road as far as Positano. The sunset will be seen from a terrace overlooking the town before a walk down the narrow lanes taking you past shops, boutiques and magical settings. There will time for sight seeing before a traditional three course meal in a restaurant overlooking the beach and the bay of Naples. The return to Sorrento will be late evening, around 11.00 pm. You will be advised of the pickup time for your accommodation. After reservations have been confirmed payment can be made by credit card before the visit or in the Sorrento office itself, whichever is the more convenient. This is a small group tour with a maximum of 18 passengers. Dinner with water is included in the price of this excursion. Comfortable shoes and a jacket for the evening are recommended. The lanes are quite steep with many steps. "Just wanted to say a big thank you for the excellent trips that you organised for us last week during our stay in Sorrento, both trips were of high standard and all the people we dealt with in Sorrento were very very good. Once again many thanks and we have already passed on your name to other people." We've just arrived home from a fantastic holiday in Sorrento. Thank you so much to you and your company for making it such a memorable trip. The transfers between Naples airport and our hotel were relaxing and drivers were welcoming and professional; the private tour on our first day was outstanding; the tour of Pompeii was well organised and informative. We would recommend ‘Friends of Sorrento’ to anyone going there, all our trips were booked in advance from the UK by e-mail. We didn’t pay until we arrived and the tickets were brought to the hotel and we paid by card with no hidden charges. They were the cheapest prices at the time on the net and undercut all the big tour operators’ and gave 10% discount on top of that. The tours were all magnificent and well worth doing.